What I Say.....Oh my goodness. I could NOT put this book down. I have read Karen White before and liked her, read Beatriz Williams and LOVED her, and have never read Lauren Willis but will now be looking for her. I assume each one wrote one of the storylines as this was the story of three generations connected by the same history and the same mansion, all in incredibly different ways. The story spans generations, and goes before the Second World War, to the time of upstairs/downstairs mansions, the servants and the families that they serve. I always find these types of stories so fascinating, as you see the class divide, but how many people crossed those lines for love. Olive's story was my favorite. She wanted so badly to believe that love could break down the walls, but her doubt was her own worst enemy. I don't want to give any spoilers away because I want everyone to read this for themselves. It was very reminiscent of one of my all time favorite books, The Shell Seekers. I am such a sucker for WWII stories, complete with star-crossed love. In that era, people were more concerned about doing what was right rather than doing whatever they wanted. 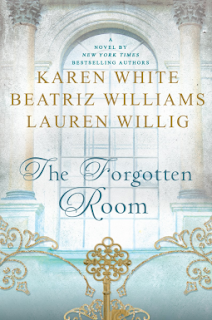 Now if you'll excuse me, I need to go buy all the Karen White, Lauren Willig and Beatriz William's books.